Before HANA, querying large datasets in an ERP system could be time consuming, and degrade overall performance. Data Warehouses were used to create persisted data models using advanced modelling techniques to improve query performance. SAP HANA removes the performance issue in ERP out of the equation, allowing us to create Virtual Data Models (VDM) directly in ERP with incredible performance. As the slide suggests, at a high level, the VDM consists of CDS Views reading data from tables in the DB, which are then read by other CDS views, without any persistency, happening in real time. Are always preceded by the @ symbol. Analytics.query By tagging the CDS view, the developer can specify which views will be exposed to the analytic manager. This type of view will be interpreted as an analytic query by the analytic manager. #CONSUMPTION Views that serve for specific application purposes and may be defined based upon public interface (for example, BASIC and COMPOSITE) views. This would be equivalent to a BW Query, where we specify a particular layout, variables, RKFs and CKFs, totals, etc. By tagging the CDS view, the developer can specify which views will be exposed to the analytic manager. This type of view will be interpreted as an analytic query by the analytic manager. Indicates that the annotated entity represents texts. Usually one key element is of type language. Most specific element (field or managed association) of the primary key (indicated by the keyword KEY) that represents the entity which the view is based on. This element shall be used as the anchor for defining foreign key relationships (except for text views): The foreign key field corresponding to the representative key represents the entity. As such it can be called representative foreign key element. The foreign key association is defined on the representative foreign key element. The name of the representative key typically equals the name of the entity represented by the view. For non-text views it is the key element for which the view serves as a value list/check table. 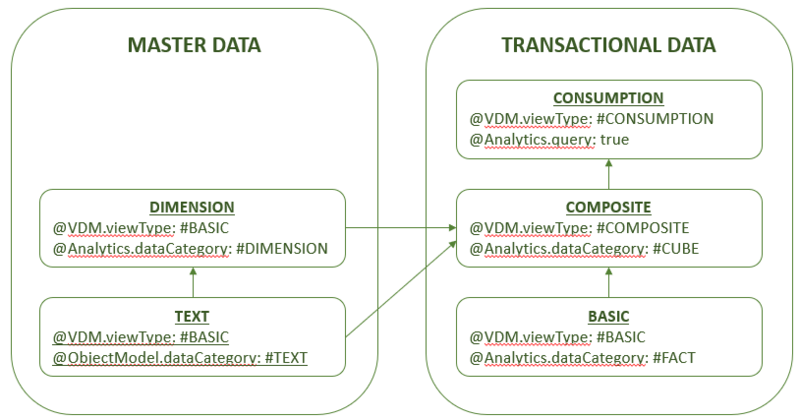 For text views (@ObjectModel.dataCategory: #TEXT) it identifies the key element to which the text fields relate to. The representative key element has to be modelled explicitly even if there is only one primary key field (no implicit derivation). Notice how the concepts are similar to that of a BW environment. We have texts and dimension CDS Views. We can build these once and re-utilize them across any number of transactional CDS views. Think of this as building a material dimension and text views. You only need to build this once, as the base tables won’t change (MARA and MAKT). But for every transactional model built (Sales, Deliveries, COPA, Inventory, etc.) where you require material description or attributes, you can re-utilize that dimension and text view. Notice how we haven’t applied any semantics (Annotations) to the fields in the select list, since this is the BASIC view, and we’re creating the FACT of our model. Semantic annotations will be applied at the composite view. Also note that a virtual data model can be comprised of multiple BASIC/FACT views depending on requirements. Once you learn how to model using CDS Views, the time to develop a VDM can be very fast, translating to delivering quick and efficient reporting solutions to customers. Regarding performance, the VDM is amazing for high volume high aggregation scenarios. I built a model at a client on Purchase Orders, going from the header down to the schedule line, with many master data joins. The schedule line table had about 250 Million records, across 8 years of data at the time. When running a summarized report with no filters, with 3 measures on the columns and just the year on the drill down (8 rows, 3 columns, 24 data points), the report returned in 1-2 seconds!!! Now, using the same data model above, when I ran a very detailed report, going down to the schedule line item, bringing many different attributes, with about 30 rows in the drilldown, for an entire month, that report took 10 minutes to run. Why? Because it was doing all the joins and calculations I had defined in the model in real time, and was very process intensive. The scenario above would be a great candidate for a persisted solution in BW, where the ETL has taken care of any calculations and data joins. The data is persisted in an ADSO and when a report is run, it is simply selecting the data based on the criteria, without the need of any additional processing, with the expectation of performance in the sub second region. So with this I hope I was able to provide information on the Virtual Data Model using CDS Views. I hope I was able to provide context regarding performance expectations, and that this is a great solution for real time operational reporting, but each reporting scenario must be addressed individually to assess the suitability of the solution. As always – the answer is “It Depends”. Just getting into CDS myself.